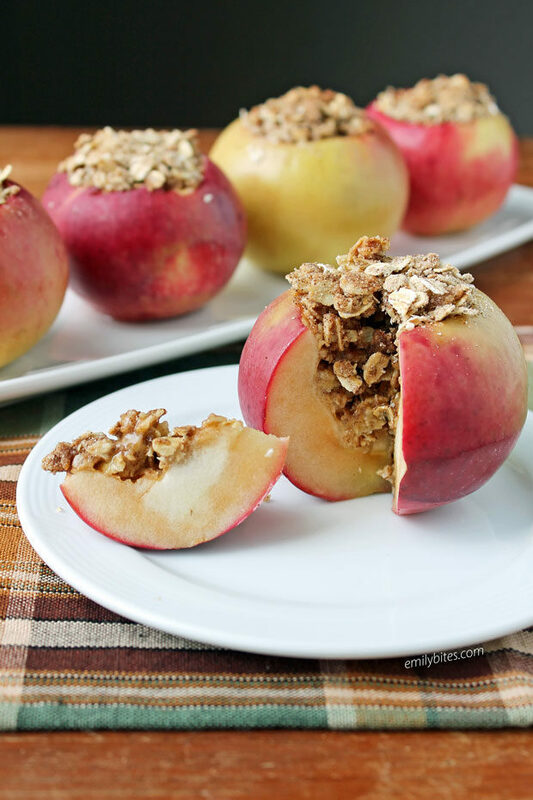 Apple crisp is one of my all-time favorite desserts, and these rustic Baked Stuffed Apples are like a healthier, single serve crisp that completely fulfills my cravings. Plus, they’re adorable, so they’re great to serve company or your family. I love eating these on their own but you can also serve them hot out of the oven with a little scoop of vanilla ice cream if you like. These Baked Stuffed Apples make a great fall dessert, but I’m not going to pretend I haven’t also eaten one for breakfast when there are leftovers! 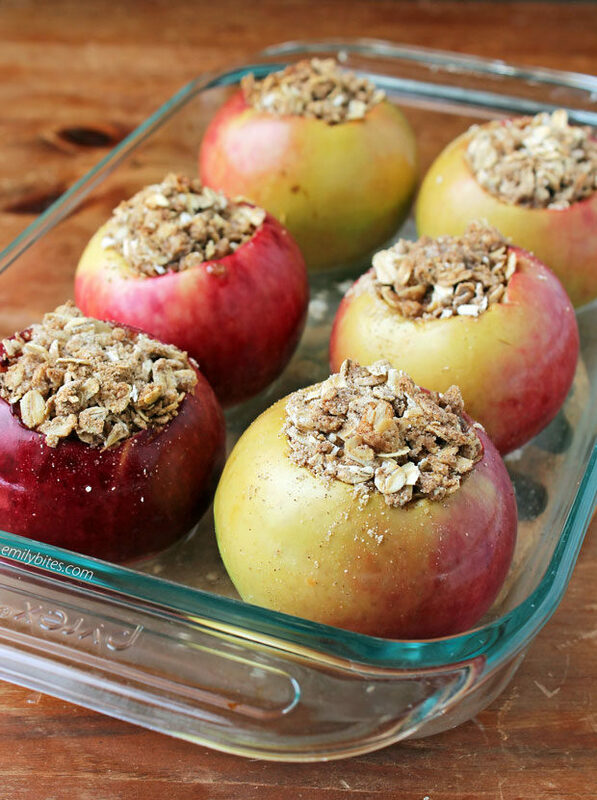 Better still, each of these stuffed apples are only 222 calories or 5 Weight Watchers SmartPoints! 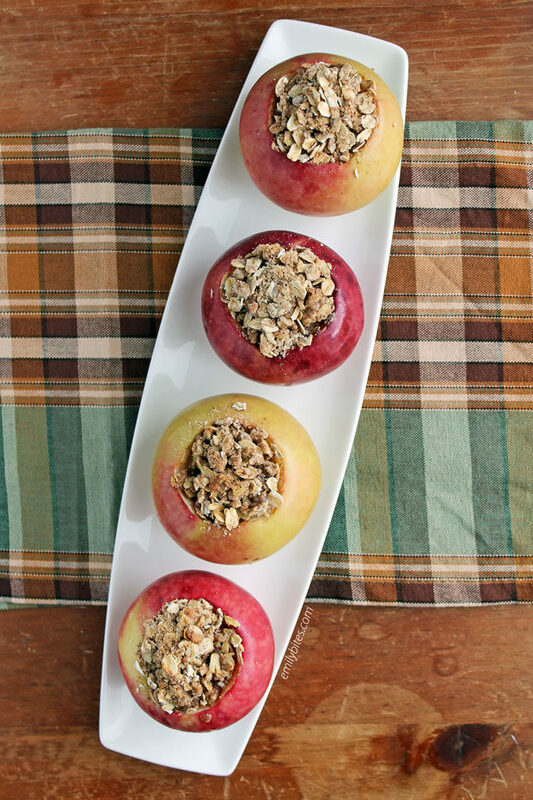 Looking for more tasty ways to enjoy apples this fall? Check out my Slow Cooker Apple Bacon BBQ Pulled Pork, Apple Cinnamon Pancakes, Sausage Apple Cheddar Frittata, Apple Cinnamon Cheesecake Cups, Apple Cheddar Turkey Wraps, Apple Cinnamon Slow Cooker Oatmeal, Broccoli Salad, Apple Streusel French Toast Muffins, Harvest Apple Salad, Cheesy Apple Walnut Bruschetta, Mini Cinnamon Apple Tarts, Stuffed Acorn Squash, Apple Cinnamon Baked Oatmeal Singles, Slow Cooker Applesauce and more in the Apple category of my recipe index! Preheat the oven to 400 degrees. Put about ½ inch deep of water in a baking dish and set aside. Combine the oats, flour, brown sugar, cinnamon, vanilla extract and salt in a mixing bowl and stir together. Add the chopped butter and use your fingers or a fork to mush the butter into the other ingredients to form crumbles. Use a paring knife and/or a spoon to scoop out the center of your apples, removing the core and seeds but allowing the bottom of the apple to stay intact. I used the knife to get started and then scooped with a spoon. Fill each apple with the filling you made in step two and place the apples into the prepared baking dish. Place the dish in the oven and bake for 15-20 minutes until your apples are softened but not mushy/still firm and the top of the filling is crispy. Serve warm. I just made this tonight. Used some ‘Red Tango’ apples and it was wonderful! Thank you for the great recipe. Another winner! !